Today I was asked by one of my favorite bedding companies, Crane and Canopy, to participate in their "Make Your Bed Series" by sharing my thoughts on how to make the perfect bed. This could not have come at a more perfect time as just last week I refreshed my daughters room with new bedding. Using her new bed as an example, I'd like to share my recipe for the perfect teen bed along with some secret tips and tricks I often use as a professional home stylist. Like most teen girls, my daughter leads a very busy life with school, sports and social events. The most important thing about her bed is that it provides her with a comfortable, relaxing sleep environment. To achieve this, I started with the basics. A firm mattress topped with a premium mattress cover for added loft and a few good quality sleeping pillows. From there, I layered on the bedding. Due to our ever-changing Michigan climate, layering is key for comfort. The first layer I incorporated was a nice quality, cotton sheet set. Nothing provides that "cold-sheet feeling" better than clean cotton sheets. For my second layer, I typically use a coverlet or quilt, but in this case I applied a trick that I sometimes use that was inspired by a stay in a top-notch hotel. Are you ready for this…it's an empty duvet cover. I laid an empty organic cotton duvet cover over the sheet set. It gives her the same cool comfort achieved by using multiple layers of cotton sheets as opposed to a heavy coverlet or quilt. The final layer of comfort was provided by a fluffy, down-filled duvet covered with a gorgeous, silky smooth, crisp, pearl white, pin tuck duvet cover (The Valencia by Crane and Canopy). I went with a queen sized duvet and cover set even though her bed is only a twin. This is another trick I often employ to make the bed appear and feel more luxurious. This element gives the bed a dreamy, cloud-like quality that evokes sleep. It goes without saying that the most important function of any bed is that it provides a comfortable, restful nights sleep. But, in the case of a teenager who spends a lot of time in her room, the bed is the main source of seating and must serve many purposes. It's important that it can accommodate evening homework sessions, daily lounging and weekend sleepover guests. Lots of pillows including a nice firm lumbar shaped pillow will giver her the back support needed to sit up in bed while lounging. A lamp added behind the headboard provides additional task lighting for studying. A stack of storage boxes next to the bed gives her a place to keep her supplies handy and also doubles as a night stand when a lucite tray is placed on top. The trundle provides a perfect spot for overnight guests and tucks away neatly when not in use. Extra blankets and pillows can be stored right on the trundle mattress making sure it's ready for guests at any moment. 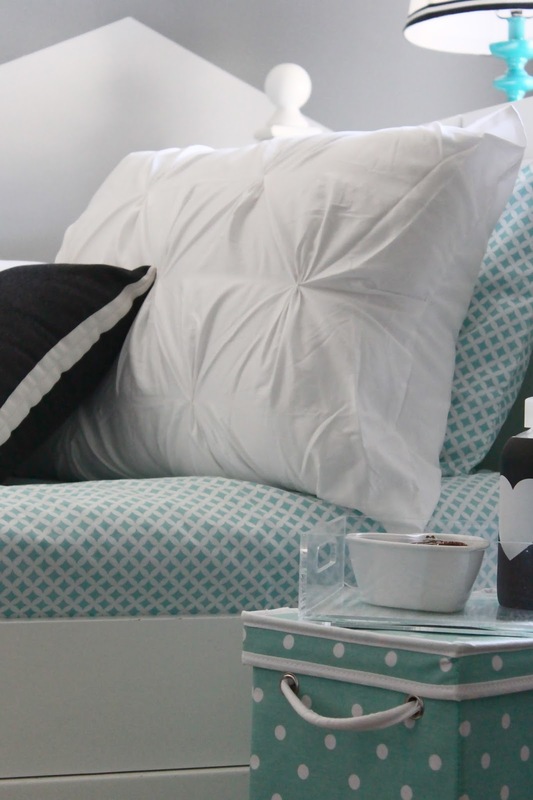 The last element required for the perfect bed for today's teenage girl is style. The look I created in my daughters room has a young fresh vibe that was achieved with the use of contrasting colors, layering textures and mixing patterns. For example, the use of black and white accents provides eye-catching contrast and drama that appeals to most teens (Lol). Varying textures lend interest to the predominately white color scheme and keeps the white on white layers from looking flat. Some of the different textures applied were the delicate pin-tucks in the duvet, a hand-stitched rosette accent pillow and a faux fur rug. The graphic chevron accent wall makes the bed the focal point of the space. 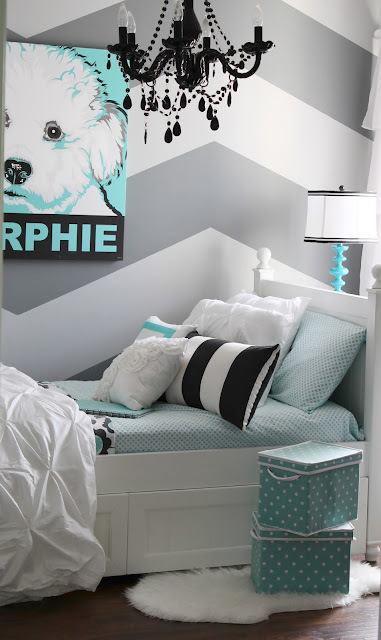 The chevron pattern gives the room a ton of style and draws your eye straight to her sumptuous new bedding. Mixing this pattern with the striped pillow, diamond patterned sheet set, floral print blanket, and polka dot totes keeps the look young and modern. Thanks, Crane and Canopy for asking me to participate in your Make Your Bed Series! Crane & Canopy was conceived to deliver high quality designer bedding and duvet covers at an innovative price point, starting at $99. They design original products, connect customers with premium factories, and strive to bring modern home decor to our customers at a fraction of the cost of traditional bedding retailers. *I received The Valencia Duvet Set from Crane and Canopy in order to facilitate this post.